can't construe - but at which, captain, I cried: Enough! Justin looked at him warily, but Flavius never moved; it was as though he had known what Carausius would say. Unfortunately for Carausius, and perhaps for the country, he did not escape a knife in the back. 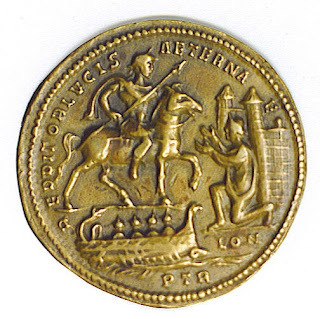 He was assassinated in AD 293 by his finance minister, Allectus, who clung onto power until the Roman reconquest. The Carausian revolt erupted just a decade after the end of the so-called 'Gallic Empire', where, between AD 260 and 274, the usurper, Postumus, had assumed control of Britain and Gaul in an almost identical manner. It surprises me greatly that none of this history, so far as I can tell, has been referred to in the endless media commentary surrounding Brexit. Carausius, in many ways, can be seen as the first Euro-sceptic. His revolt shows that in some sense Britain is indeed 'set apart', as William Wildblood cogently argued in his post 'Albion Set Apart' on 18th November 2017. So far, so straightforward. But there is more going on here. Jones talks about the 'restoration of Britain to unity with the West' and the 'return of Britain to the light of civilisation.' For him (and the designer of the Beauvains coin), the restoration of direct Roman rule is clearly a good thing. But that is because Constantius openly declares himself the representative and restorer of a higher principle - the 'eternal light' of civilisation, heaven and the gods. The contrast with the European Union, jumping to contemporary times, couldn't be more stark. One of the great misjudgements of the Remain campaign, in my view, was to conflate Europe with the EU. Europe is a civilisation - at least 3000 years old - and a vast physical space, stretching from the Mayo coastline to the Ural Mountains. The EU is an institution, no different in essence from any other institution - Barclays Bank, for instance, or Her Majesty's Revenue and Customs. It exists to maintain and perpetuate itself. It is grey, bureaucratic and faceless, with little of the romance, glamour and rebel-chic some Remainers project onto it. It has no links with any higher principle, as symbolised by the EU flag, twelve yellow stars in a circle on a blue background with absolutely nothing in the centre. You would get extremely long odds on a functionary like Jean-Claude Juncker styling himself Redditor Lucis Aeternae. Juncker himself would be appalled at the thought, and that says everything, to my mind, about where his institution stands spiritually and philosophically. Nowhere at all, in brief. The EU's big problem is that it has no spiritual dimension whatsoever. It doesn't know how to connect with people on the level of spirit and imagination. It has no spark, no fire, and has, in recent years, become increasingly hostile to the Gospel despite the religious faith of its founders and its roots in post-war Christian Democracy. More sobering than the EU's shortcomings, however, is the sad fact that were a Restorer of the Eternal Light to turn up at a British port tomorrow he would most likely be deported straightaway. It is someone or something on this level, I believe, that 52% of the British people were, perhaps unconsciously, voting for in the 2016 referendum. Something essentially spiritual. But this has been not been understood, acknowledged or reflected in all the debate that has gone on since in Westminster and the media. Pro-Leave circles are perhaps the worst. A paper like The Daily Telegraph, for instance, views Brexit exclusively in terms of its potential for economic growth and increased global trade. It doesn't see it as an opportunity for spiritual and cultural renewal. It doesn't even go there, and this, I feel, is emblematic of a stunning lack of imagination and independent thought running right through the UK establishment. Now, I'm not naive enough to think that the V4 don't have challenges and temptations of their own, but they are at least facing in the right direction, which is probably more than can be said for the UK at this moment. The only thing that can reorient us, I believe, is something that will never happen because the world today is so addicted to restlessness and ceaseless change. Britain needs to step off the wheel, in short. She needs to take a break and gather her thoughts, pressing the pause button for as long as it takes, so her inhabitants can start to feel their way into the essence and soul of the country, beginning to think seriously about what British identity is and what kind of relationships we would like to have, first of all between the UK's four constituent parts, then towards Europe, and finally to the world beyond. Such a space for quiet recollection will never be officially sanctioned, as I say, but there's nothing to stop us engaging in it ourselves as individuals or groups. We could read John Michell's The Traveller's Key to Sacred England, maybe, and visit some of the sites he mentions. For more on this, please see Bruce Charlton's post of 4th January 2018. Or, as Bruce also suggests, we could read Geoffrey of Monmouth's, History of the Kings of Britain, or immerse ourselves in any of the titles discussed in William's Albion Awakening Booklist post of 17th December 2017. Whatever we choose to do, it is less opinion and debate that is required and more thought and reflection. We have become fixated, to a degree, on political procedures and solutions. But there is a pre-political level of myth and intuition which drives the direction a society takes at a more fundamental level. It's all about the kind of stories we tell ourselves and the stories we believe to be true or false. We need to return for a while to the primal, archetypal level of things, then tune back in to the land we have become alienated from, and listen to the story it's telling us. Where does it want to go? What does it want us to do? Then we can step forward into the future in confidence and clarity of mind. Maybe what emerges from our time in the wilderness will appear strange and unsettling. The Russian Orthodox priest, Fr. Andrew Phillips, has proposed on his blog (www.orthodoxengland.net) the dissolution of the UK and its replacement by another acronym, IONA - The Isles of the Northern Sea. He wants Westminster to become the site of a devolved English Parliament and for central government to relocate to the Isle of Man, an island rich in British mythological lore and within sight, as it were, of all four countries. It could well be that such a radical reimagining of who we are is exactly what is needed to propel us out of the current impasse. But nothing authentic or original will come to the surface without contemplation and stillness. We have to get beyond the head level - into the heart, the imagination and the guts. Argument and counter argument will get us precisely nowhere. We'll be stuck at the level of cliché forever, more and more dependent on the market and the state (and increasingly technology) to provide us with answers to problems we don't have the imaginative capacity to deal with any more. The still small voice that Elijah heard on Mount Horeb is there for nations just as much as it is for individuals. And it is that still small voice - more than any Emperor, military commander or referendum result - which is the true Redditor Lucis Aeternae. I personally believe that the era of patriotic/ spiritual/ romantic nationalism was a brief one - and is several generations past - even in Ireland. The future is with a national patriotism which comes *from* Christ, and is dedicated to God's work. I can't easily see this working from a level of the British Isles, and probably not even from the British mainland. I believe that England now has a deeper and more powerful love of nation than the Scots or Welsh - whose romanticism has been very thoroughly subverted by leftism, economic dependence and manipulated anti-England resentments. Although this current English romanticism is almost entirely invisible in public discourse, it can be seen in the kinds of books increasingly being produced and sold (in response to demand) in the National Trust shops and other similar 'heritage' sites. These are nostalgic, and perhaps sentimental - but the number and range of such books is remarkable. For example, I was browsing one the other day about some of the great trees of England. A surprisingly high proportion of cars in this area (including mine) have a discreet Northumbrian flag sticker on the back - and no other sticker. What holds all this in check is a version of Owen Barfield's Residual Unresolved Positivism - which is an unthinking inculcated Leftism. English Leftism was populist (comapred to, say, the French or Russian versions), had deep roots, and was woven with a lot of good things. An appealing character such as William Cobbett was an example; the old Methodist church was another. Now these good aspects of Leftism have created a residual sentimental affection which is easily manipulated (eg. by the dishonest and malignant Jeremy Corbyn), and which prevents the necessary Christian core from forming and growing in the hearts of Men. The English feel guilty about their love of country; we can easily be diverted and have their motivations dispersed by claims of injustice, poverty, misery and the like. But the sheer extremity of our distraction and short-termism is itself a potential brittleness - the colossal edifice of manipulation seems to rely on eternal growth; and may very suddenly crack and shatter. If so, there are good seeds in buried deep the hearts of many English, which could grow. About the symbolic emptiness of the EU: try an image search for "Europe many languages one voice". Apparently some European authority actually commissioned a poster having this title. On one of the submissions, the circle of twelve yellow stars shines in the blue sky over Bruegel's Tower of Babel, redrawn with the addition of a crane on one of the top levels to show that the work is still in progress. Great post, John, packed full of insights. It should be in a national newspaper rather than hidden away on a blog. It's much wiser than anything I've seen in the mainstream media. I've often thought about the hollow symbolism of the EU flag with its absence of a centre. A celebration of nothing.
" It should be in a national newspaper rather than hidden away on a blog." To be honest, it will probably have as much/ more real impact here as if it was published in The Times - I have quite often published in the national press (Times, Independent, Guardian), and the pieces either sink without trace or are misunderstood; I have found a better (and bigger!) audience when blogging. What i really meant to point to was the absurdity of articles like this being tucked away rather than widely available. But I'm sure you're right that the audience here is more discerning! As a confused "Christian perennialist" I find your website inspirational. I have no one I can talk to about this sort of thing.. Often feel disconnected from society but very connected to local landscape. @David - Yes, me too. I know what you mean. Thanks and all the best. "If what I've read about the explicitly Marian original reference of the circle of stars (Rev./Apoc. 12) is true, there is terrible irony in their hijacking and emptying and 'revaluing' into something merely this-worldly and idolatrously self-regarding, rather than representing an aspiration to something like the choreae of Dante's Paradiso! "By the way, have a look at Tolkien's rediscovered poem,'Noel', in this context - sadly unavailable officially, as far as I know, but lurking here an there online as a sort of samizdat!" I'll find that poem, David. Thank you very much. That's a very perceptive comment about the EU stars as well.